Byzantine Legwear - an Interesting Constructional Detail from St. Saviour in Chora (Kariye Müzesi). 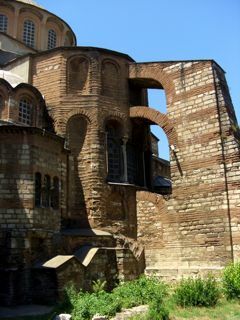 The former monastery and church of St. Saviour in Chora (in Turkish, Kariye Müzesi: link to Wikipedia entry) is located in the north-western outskirts of Constantinople, close to the Adrianople Gate in the Walls of Theodosius. Founded in the fifth century, successive churches have been built on the site - the core of the current structure is of the 11th and 12th century. In the late Byzantine period it rose in importance due to its closeness to the Palace of Vlachernae, then the main imperial residence. Theodore Metochites, Grand Logothete (prime minister) of the Byzantine Empire, undertook the repair, enlarging and renovation of the church during the years 1316 to 1321, endowing Kariye Müzesi with one of the finest and most complete surviving examples of late Byzantine church decoration, involving both mosaics and fresco painting. The lower part of the southern wall of the outer gallery or parekklesion is decorated with full-length portraits of military saints in fresco. St. Theodore Stratelates ('the General') stands near the centre, partly covered by a stone frieze arching over the niche of a later tomb. Though his armour conciously harks back to long-obsolete models of Greco-Roman style from Antiquity, Theodore's clothing is middle Byzantine - a colorful long sleeved tunic, close fitting leggings, and calf high boots. He stands on his discarded boot, which must be made of thin and supple leather to be crumpled so. His shod left foot shows their normal appearance, half-height red boots in the Imperial style with broad gold bands at top and ankle. Peter Beatson, from visit to Kariye Müzesi, Istanbul 26th June 2009. Paul A. Underwood, Kariye Djami. Vol. 1 - Historical Introduction and Description of the Mosaics and Frescoes. Routledge & Kegan Paul, London 1967. 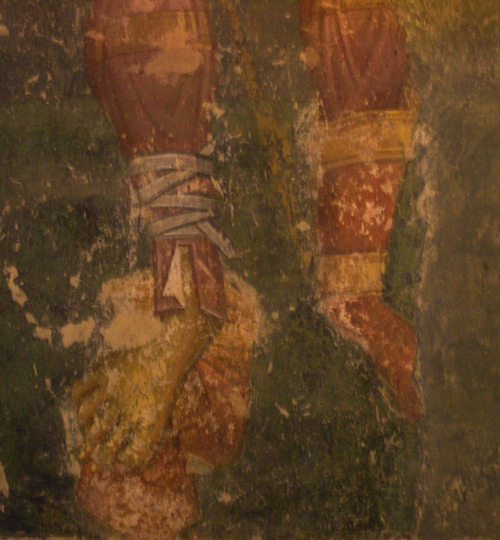 This is not a regular feature of the iconography of St. Theodore Stratelates, and only a few other late Byzantine images of warrior saints with a bare foot are known (Underwood, p.254). The symbolic meaning has been lost, though it may allude to Classical examples of heroism - for example the Jason and the Argonauts myth. Early in his career, Jason carried an old woman across the Anauros or Enipeus River. She was no ordinary mortal, but Hera in disguise. In the crossing, Jason lost a sandal, and so appeared in Iolkos as the man in one sandal (monosandalos), foretold to kill the evil King Pelias. Kerényi (Heroes, 248) remarks that the Monosandalos is an uncanny being, often with an Underworld connection, for he has left one sandal in the Underworld as a sign of allegiance to it. However in a Christian martyr's context this would more likely be understood as conquering Death. Thanks to Peter Raftos for this information. Byzantine Legwear - an Interesting Constructional Detail from St. Saviour in Chora (Kariye Müzesi), written and webbed by Peter Beatson. (c) Birka Traders 2009. Not to be copied without permission.